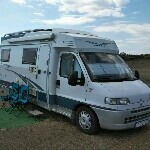 We are THE friendliest motorhome forum, please register to join in the fun, and have access to all areas. Have decided to change the gearbox in Vera, mainly due to the loss of oil i had a few years ago which caused 5th to fail and i now have lost the syncro for 2nd, it goes in and stays in but its crunchy !!! So i am looking for recommendations of places that can supply and fit a Gearbox Type MG5T, perhaps you or a friend have used some one and are happy with them. Anywhere in UK is ok and thanks for reading. I used a company in Wakefield, EP transmissions, reasonable price they remove the box too, a used box is likely to have come from a high mileage van and be more worn than your existing one. If you're not the lead dog, your view never changes. Don't force it, use a bigger hammer. Semper ubi, Sub ubi. Hi Kev, did they fit a recon box, if so idea of price would be helpful, pm me . presently in Wales but Wakefield is do able. When I was working in the motor factor we would use Ivor Searle in Soham, ivorsearle.co.uk call 01353 720531. We always found them to be very helpful. We’d buy around a dozen or more engines and gearboxes a year from them. They must be OK or we wouldn’t use them as it’s too much hassle trying to sort out warranty issues 2nd hand. Thanks Simon, will message them later this week. I just had them fix the 5th bear issue this is 6 years ago, can't recall exact price but 180 springs to mind.